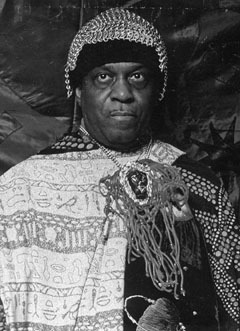 Sun Ra was one of the weirdest, wackiest, wildest, most eclectic, eccentric, esoteric, theatrical, inscrutable figures in the entire history of black music. Yes – I have used quite a lot of adjectives here to describe this iconoclastic maverick. But, a man of such complexity and depth cannot be easily described by using one or two words. Ra needs a lexicon all of his own to help us fathom this unique polymath: an “out-there” pianist, organist, keyboard player, improviser, composer, arranger, poet, philosopher, Egyptologist, alchemist, visionary, altruist, pacifist. But, like the great Sphinx itself, we may never be able to fully solve the puzzle, the riddle, the mystery. April’s Jazz in the Round offered us a fascinating insight into the unique parallel universe that Alabama-born Henry Poole Blount (to give Ra his rightful birth name) inhabited. Eschewing the typical J.I.T.R. tripartite format of up and coming band/solo set/headline act, the whole evening was a magnificent, multi-layered celebration of the life and music of the enigma that is Sun Ra. The event was the brain-child of the series’ presenter, mover and shaker, Jez Nelson. Nelson has been a devotee and tireless champion of Ra’s music ever since he fortuitously interviewed the Black American icon in the very early days of Jazz FM. As Jez explains: “In June 1990 I was 26 and by some fluke presenting a nightly four hour programme on the newly launched Jazz FM. One morning my boss said there’s a guy in town that sounded interesting and would I like him on the show that night. His name was Sun Ra. I hardly knew anything about Ra at that point but his appearance on my show that evening changed my life. He arrived wearing a flowing cape and the most extraordinary Russian fur hat…Ra’s very first words were “I’m not a man I’m an angel”. Now I’m an atheist but Ra was certainly the most extra-ordinary being I have ever met in my life and in many ways he has been like a guardian angel for me and my career”. Nelson’s hour long documentary was hugely informative , entertaining and inspiring. There was some great footage of those leftfield Ra luminaries , saxophone giants John Gilmore and Marshall Allen, honking and cascading cosmic notes, while the imperious and statuesque singer June Tyson strutted her stuff with a “don’t mess with me” attitude. The avant-garde beat poet John Sinclair, Ra soul-mate Archie Shepp and Ra’s biographer John Szwed gave us a little window into the mind, music and theatre of Ra, for Ra’s music was indeed great theatre. His performances were often pure spectacle, sometimes 5 or 6 hours long featuring fire-eaters, muscle men, midgets and dancers, with communal free form blowing, pop songs, big band swing arrangements, doo-wop, disco, Chopin and Rachmaninoff, Ellington, Monk and Jelly Roll Morton all somehow managing to be part of the gloriously chaotic and wildly eclectic equation. And of course there were the space hymns such as “Love in Outer Space” and “The Satellites are Spinning”. Ra was clearly ahead of his time. A surrealist and a prophet, his music, writing and poems foretold the coming of electronics, space travel and the computer age long before these things became a reality. However, behind the exotic Egyptian head gear, flashing lights and cosmic space-age sound was a serious man who felt deeply for the plight of his black brothers living in a racially intolerant America. His way of helping his fellow man was not actively engaging in the civil rights movement but by feeding and lodging his musicians, whether his commune of Arkestra-members were based in New York, Philadelphia or in Oakland, California. He gave his musicians a sense of purpose. He gave them pride and dignity, lecturing them on personal discipline, on the history of the black people and their important role in the creation of civilization. He also demanded abstinence from drugs and alcohol and discouraged fraternising with women. The man who said he was not a man but an alien from outer-space, born on the planet Saturn, was a very fine example of a homosapien after all. A man of peace, he possessed the best of human qualities, an altruist empathetic to those discriminated against because of the colour of their skin. But, band members beware: woe-be-tide if you fluff your lines. If you do, you are liable to find yourself on a chair infront of the stage minus your instrument. You’re to stay there, impotent, until the end of the show, forced to listen to the mayhem that might surround you without being able to do anything about it. Enigmatic or what?! Alexander Hawkins is a brilliant pianist, composer, improviser and, like Jez Nelson, a great supporter of Sun Ra’s music. I had the privilege of reviewing one of his gigs awhile back at J.I.T.R. Tonight, his set consisted of two numbers, the first a Hawkins original which reflected the eclectic modus operandi of a Ra opus. The piece began with him quietly whistling and playing an ultra-simple melody in the treble register of the piano before he lovingly caressed the strings inside. It didn’t take too long before he got hearts quickening with infectious boogie-woogie before manic fists and elbows delivered hammer blows to the keys. Simplicity, bitonality, polytonality and surging polyrhythmic complexity – the music had it all. The number ended quietly and simply, just as it had begun. In the second and final piece, Strayhorn’s “Take the A Train” was referenced several times, the tune deconstructed and given a fresh perspective (Ra would often do the same kind of thing to this very tune in his own performances) as well as quoting from Ra originals such as “Angel Race”, “Fate in a Pleasant mood” and “Love in Outer Space”. The performance ended in a mood of quiet beauty, Hawkins intoning Ra’s words: “We Travel the Spaceways from Planet to Planet”. Gilles Peterson discussed his collection of rare Ra vinyls, Alexander and Jez contributing hugely to this informal section with learned observations and crazy stories in a 3-way dialogue that had the audience on the edge of their seats. There was no water in the toilets, the microphone suddenly decided not to work. “Ah that must be Ra looking down on us from outer space” quipped Jez. wonderful cosmic journey through outer space and more earth-bound grooves. They’re a very tight band who have the essence and spirit of Ra down to a tee. All proceeds from the night and the record went to the Steve Reid Foundation (stevereidfoundation.org). For those of you who don’t know who Steve Reid is, he was a brilliant drummer and is a former alumni of Sun Ra. Like Ra, he was jailed for being a conscientious objector, in Reid’s case for refusing to go to war in Vietnam. He died in 2010 from throat cancer at the age of 66. When he was in his hour of greatest need he was seriously let down by a lack of care in the American health system. In the four hour gig I learned so much more about Sun Ra than I knew already (which I admit was not a fantastic amount) and got to know about Steve Reid and the wonderful charitable organisation that keeps his name alive. What a power for good Jazz in the Round is. Long may it continue.